Information provided by Intel in its own presentations about its upcoming mainstream LGA1155 Sandy Bridge CPUs appears to confirm the company has designed the CPUs to deliberately limit overclocking. 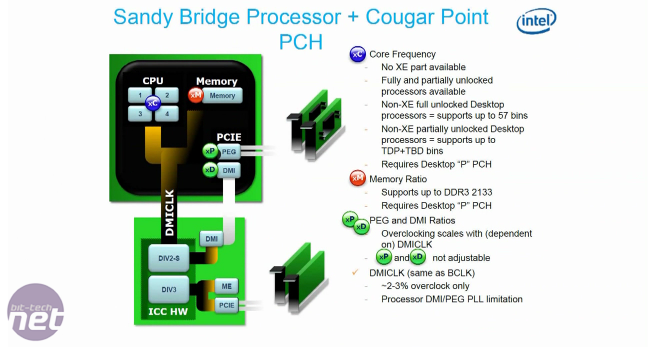 A video leaked to HKEPC and posted on YouTube (see from 2mins onwards) confirms the fact that only a 2-3 per cent OC via Base Clock adjustments will be possible. 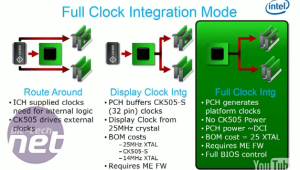 This is because Intel has tied the speed of every bus (USB, SATA, PCI, PCI-E, CPU cores, Uncore, memory etc) to a single internal clock generator issuing the basic 100MHz Base Clock. 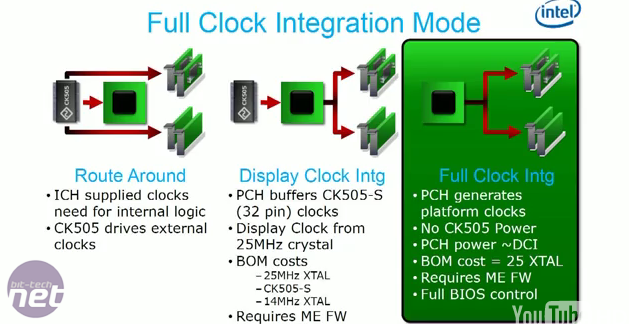 This clock gen is integrated into the P67 motherboard chipset and transmits the clock signal to the CPU via the DMI bus. This means there's no need for an external clock generator that used to allow completely separate control of all the individual hardware. When you're overclocking, you want to be able to push certain frequencies, such as the Base Clock and memory clock, but leave others, such as SATA, completely stable as they're very sensitive to adjustment. 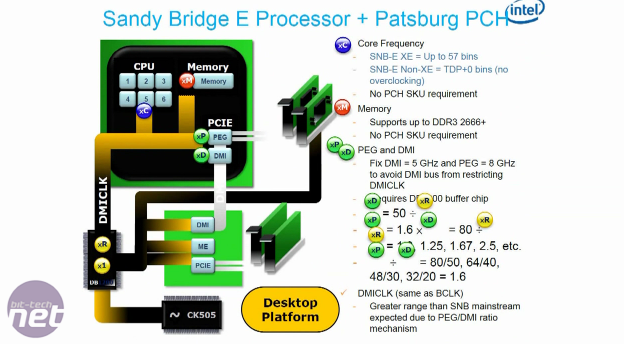 Current motherboards allow multiple bus speeds because external clock generators are programmable via the BIOS. According to one Taiwanese motherboard company, on a Sandy Bridge system, the fact that all the busses are linked means that turning up the Base Clock by just 5MHz caused the USB to fail and SATA bus to corrupt. We chatted about possible work-arounds but at the moment the few 'asynchronous' setups tried were currently not working. It's been claimed to use out-of-the-box the design was deliberately limited with the intention to simplify board design and lower costs. 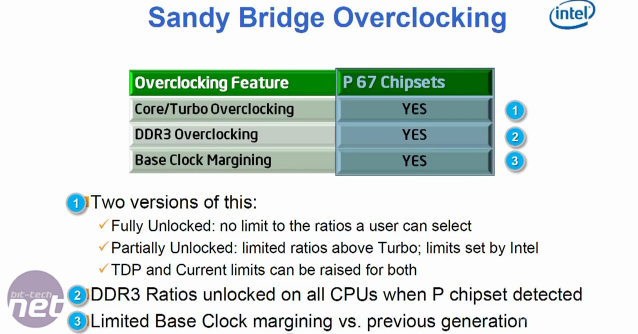 This obviously has the 'unfortunate' side effect that enthusiasts will be unable to manually overclock Sandy Bridge CPUs to their limits, but the CPU's own internal overclocking, TurboBoost, will still work and Intel will offer some controlled multiplier overhead for enthusiasts as a token gesture. At the time of writing we are still talking to Taiwan's motherboard companies, but the few we have had contact with are certainly worried as Intel's move not only impacts enthusiasts, it also takes control and emphasis away from motherboard manufacturers. After all, why would you buy one board over another if they all overclock the same? On the plus side, if a company does crack the Base Clock limit, then it means a potentially huge advantage over the competition. It's no understatement to say the next few months are crucial for the motherboard engineering teams. 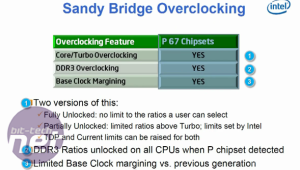 On the plus side though, memory strap limits are at present removed on sample Sandy Bridge hardware - Intel's slides claim 2,133MHz - which is nice to have, but since most of the performance comes from additional CPU MHz rather than memory speed, it's not the answer we were really looking for. 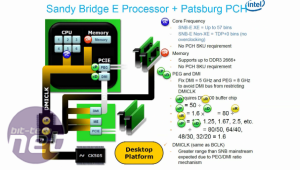 HKEPC also mirror what we've heard and go further to include details Intel's upcoming LGA2011 Sandy Bridge-E and 'Patsburg' chipset that will replace the current X58 and LGA1366 platforms. According to HKEPC the upper limit DDR3 support currently exceeds 2,666MHz (wowzers) and most importantly follows previous current generations basic designs so overclocking potential is unaffected, yet, unspecified. Intel still plans to sell K-series CPUs which come with an unlocked CPU multiplier - and with this move, the K-series CPUs start to make a lot more sense, as they will be the only Intel CPUs capable of overclocking. Is this move a slap in the face for enthusiasts that will send them towards an AMD Fusion platform or are CPUs just getting fast enough that overclocking really doesn't matter that much to you any more? Let us know what you think, in the forums. Despite the Sandy Bridge chipset flaw, Intel has reported record Q1 revenue. MSI will send you a new motherboard before you've given back your current one.